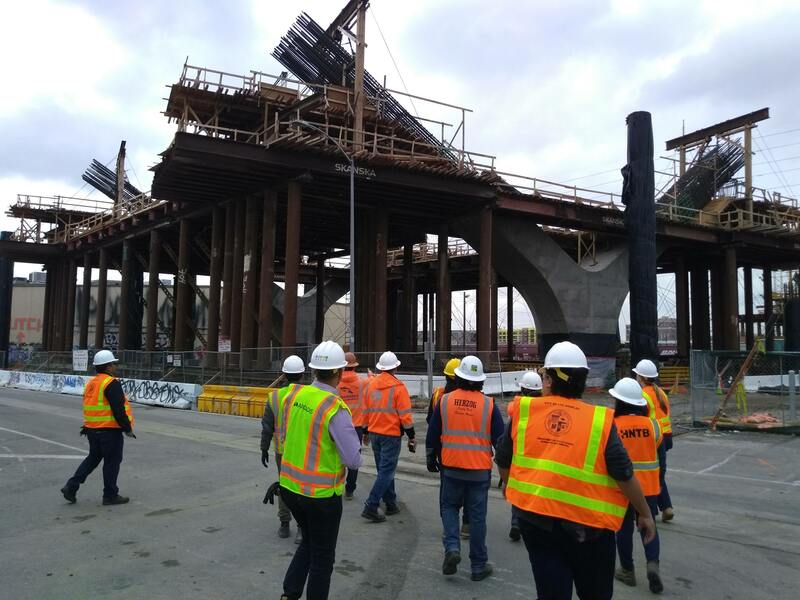 Talk of aliens and bats accompanied the 6th Street Viaduct technical tour on February 1st, 2019. Southern California residents have driven through this construction site for years and they watched the demolition of the iconic bridge just over the 101 freeway east of Downtown Los Angeles. Built in 1932, the original bridge has served as a backdrop for car commercials, movies, music videos, and TV shows for decades. From Grease to Fear the Walking Dead, if a scene is on a bridge with the Los Angeles skyline in the background, chances are it was filmed on the 6th Street Viaduct. Unfortunately, alkali-silica reactions in the concrete have taken their toll, slowly destroying the bridge from the inside out. Each of the other bridges across the LA river in the area were able to be seismically retrofitted, but the degradation of concrete of the 6th Street Viaduct is severe to the point that even its place on the National Register of Historic Places could not save it. Ironically, the 6th Street Viaduct was the newest of a series of bridges built in the 30s and now is the first to pass into history. Replacing the bridge is a near $500 million effort. The City of Los Angeles is using this opportunity to realign the bridge to eliminate an awkward kink in the road as it crosses the Los Angeles river. This means the purchasing of 34 parcels of land and the demolition of 13 buildings. The new open space created under the bridge will become a 12 acre city park. One issue for a 3,500 foot long bridge is that it does not serve the community living beneath it. Previously, if a resident wanted to walk across the Los Angeles river, he or she would need to walk over a quarter mile just to get to one end of the bridge and then walk its full length to the other side. Planners solved this issue by designing a helical, ADA compliant ramp next to the river that will give pedestrians and cyclists access to the bridge deck at mid-span. Julia Moye, a Sr. Civil Engineer for the City of Los Angeles, gave a presentation to ASCE members - highlighting some of the flaws of the original bridge and new features of its replacement. The bridge is to be base isolated, and is designed to withstand a 1,000 year seismic event and have a design life of 100 years. Among the many construction challenges was the relocation of a colony of bats living in the bridge. A suitable home was created for them on an adjacent bridge before demolition. Thankfully, the eviction is only temporary. The new bridge has incorporated a permanent bat house into its design! Robert Thorpe, a Field Engineer at Stacy and Witbeck, Inc., led a discussion on the construction challenges they have experienced to date. There are dozens of stakeholders in the project, including the Army Corps of Engineers whom maintains the concrete channel of the Los Angeles river; the Fish and Wildlife service on account of the bats; the Water Board given the Los Angeles river's classification as a navigable river; and surprisingly, the Los Angeles film industry. 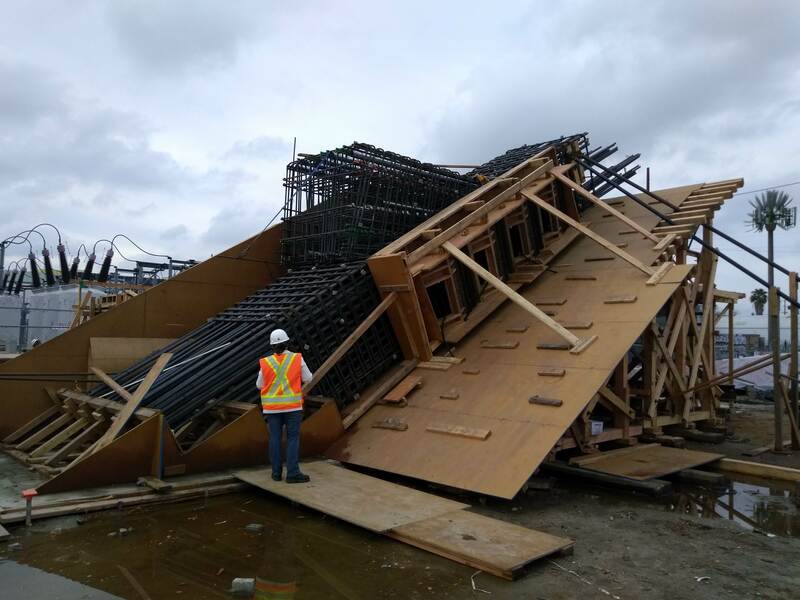 Construction activities have closed the only vehicle access to the river for several miles in each direction, rerouting film crews as far north as the 110 freeway or as far south as the City of Vernon. But of all the stakeholders, perhaps none are as invested and powerful as the five rail agencies that have easements under the bridge and on both sides of the river. Initially, the railroads were quite concerned about construction affecting shipping during the ramp up to the holiday season, that they successfully lobbied to have the project pause during the last quarter of each year. However, after several years of cooperation between all parties, the railroads allowed construction year round for the first time last year. Their primary concern is that something will fall across the tracks, also known as “fouling.” To address this risk, the contractor must pay for a full time employee from all five railroad agencies to monitor construction. If a train is coming, the railroad representative orders the construction team to lower the booms on all cranes and remove any equipment tall enough to fall across the tracks until the train passes through the job site. Robert Thorpe lead ASCE members through the sprawling construction site. They first viewed a scale mock-up of a crucial connection between several structural components. The high amount of steel reinforcement in this concrete section could cause the forest of rebar to sieve the aggregate from the cement and create large air pockets in the concrete. To address this concern, the contractor is using self-consolidating concrete and testing it on a mock-up. Once the mock-up is cured, they will literally cut it in half and inspect the inside like a geode to confirm its success. 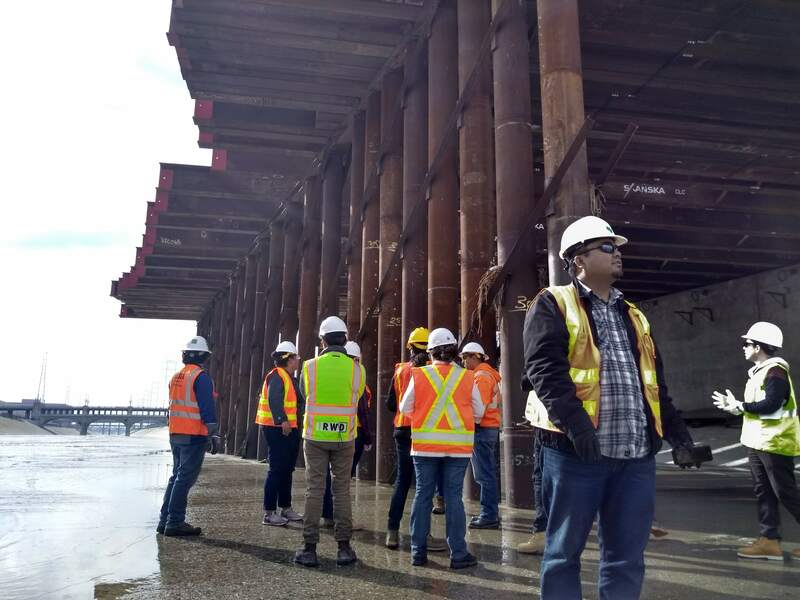 Attendees then walked down to the Los Angeles river bed and viewed temporary shoring that will support the equipment for erecting the span over the river. To get to the other side of the construction site, attendees had to return to their cars and take surface streets to adjacent bridges. Once across, Thorpe showed them huge tanks of liquid nitrogen. The chemical process of curing concrete is exothermic - that is, it produces heat. If too much concrete is poured at once, the interior of the concrete can get hot enough to boil. The contractor initially countered this problem by ordering concrete with ice mixed into it, but the concrete plant required much more lead time to ensure that it could create enough ice for the giant pours. Now the contractor keeps two towering tanks of liquid nitrogen on site to cool the concrete during pours. The tanks were housed in an area needing extensive demolition work of existing buildings. Thorpe recounted tales of some of the challenges the contractor faced. Soil contaminated with lead was found under one of the buildings. Since it was classified as hazardous waste, they had trouble finding a dump site that would accept it. In the end, they had to ship the soil to a disposal site in Nevada to finally be rid of it. One of the concrete buildings marked for demolition was built adjacent to another building. In fact, the exterior wall along the property line essentially used the brick facade of the adjacent building as part of the form, leaving the demolition contractor with little choice other than to chip bits of concrete away from the brick by hand. Other challenges were found underground. An archeologist was on call 24/7 for consultation. Every time an object like a bottle was uncovered, the project would stop while the team texted photos to the archeologist and waited for the all clear to be given. But even an archeologist would have been stumped by the strangest object they found. Beneath the surface, they uncovered a giant hunk of metal several feet long. It was so heavy that no truck could carry it away for salvage. They had to bring in what they described as a bazooka-like torch to cut the object in half. Though some theorized that the object was alien in nature, Thorpe says it is most likely an accretion of slag from welding during construction in the 30s. The tour concluded with picturesque views of the Los Angeles skyline on the east side of the project in Boyle Heights. With a little luck, and a lot of engineering, the new 6th Street Viaduct is sure to grace the skyline for another 100 years.